Fluke Networks increases the versatility and flexibility of its line of impact tools by offering a wide variety of interchangeable blades that permit each tool to perform multiple functions. From our high-performance EverSharp® blades, to our unique blade storage kit cases, Fluke Networks has the blades you need to terminate blocks and jacks quickly. These blades fit the D914S™, D914™, D814™ and D214™ Punchdown Tools. Unique blade storage case helps prevent loss. This unique blade storage case helps eliminate the problem of losing and damaging individual impact tool blades by keeping them together in one place. The compact size of the case makes it easy to carry in a pocket or clip onto a belt or tool pouch. 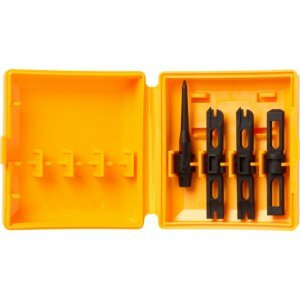 Kit includes: two 110 blades, one 630 blade, and one Wood Screw Starter Punch in a storage case.